Do I need to place an order in advance? No, it’s not always necessary. We have up to 30 flavors available daily! Our staff will be more than happy to help you with your selection when you visit one of our locations. We’re certain we’ll have many flavors you will love! How much notice is required for orders? We require a minimum of a week’s notice for all orders. Is there a minimum for special orders? Yes. A special order minimum is four dozen macarons. Do you need a variety of flavors? 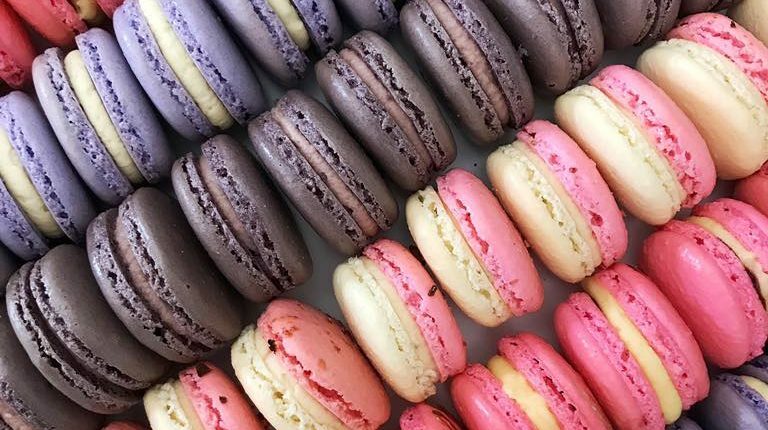 We’re happy to accommodate your request but require a minimum of a dozen macarons per flavor. Please note that all special orders must be paid in full when the order is placed. We cannot offer refunds on special orders. You will receive an invoice for your order which must be paid a minimum of a week in advance. Invoices that are overdue are subject to a $25 late fee. Please email us at orders@lebonmacaron.com to start the conversation! How do I care for my macarons? Please be sure to keep your macarons frozen or refrigerated (the freezer is preferred) until you plan to enjoy them. This ensures the quality and integrity of the macaron. Macarons thaw within 20-30 minutes and should be eaten at room temperature. Naturally macarons are a gluten-free pastry. The shell is made with sugar, almonds and egg whites. However, not all flavors are gluten-free due to the flavor of the macaron, such as brownie batter and cookies and cream. All macarons contain the following allergens: dairy, eggs, tree nuts.